Utilising four independent two-way SDI interfaces, the Blackmagic Design DeckLink Duo 2 is an adaptable video I/O card for professional video workflows. 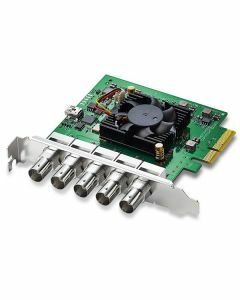 Each SDI interface can be configured to be either an input or output, meaning that a computer with this card installed can be deployed as a media play-out system, a real-time multi-channel capture system, a multi screen digital signage server, a live keyer or a combination of the above to fit a specific (and potentially niche) workflow. A reference input is also available for syncing with other studio equipment. Decklink Duo 2 provides adaptable format and system support, allowing the user to work both with compressed video formats like ProRes and DNxHD as well as 10-bit uncompressed video. For uncompressed, every image is a pixel-for-pixel carbon copy of the source, without generational loss. This affords superior colour correction, sharper keying with green screens, cleaner compositions and more. No other capture cards support more applications and more platforms than Blackmagic Design’s DeckLink series - you can always work with your favourite software. Support for common file formats provides ready-to-edit files for use in popular editing, effects, and design software applications. As a result, Decklink Duo 2 is compatible with Mac, Windows, and Linux based workstations. Sync Input: Blackburst in SD 720p50, 720p59.94, 1080i50 and 1080i59.94 formats or Tri-Sync in any HD format. Physical Installation: PCI Express 4 lane, compatible with 4 and 8 lane PCI Express slots on Mac OS X, Windows 7, Windows 8, Windows 10 and Linux. Mac OS X systems require a Mac Pro computer with PCI Express slots.